In contrast to the pale pastels of Spain's landscape, we saw great colors in the art and people of Catalan (who were considering the original settlers of Barcelona). This colorful painting under a shady aromatic tree in front of Gaudi's colorless sand church will always stay with us, fresh like the palette of paint it came from. 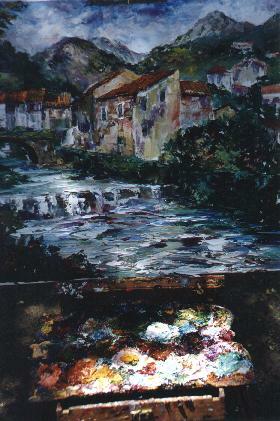 The oil painting is in the easel with a smorgasbord of oil spread over the palette below. It almost looks as if the whole thing is a painting. But it is not - it is our photos of the artist environment. We ran into a large group filming a commercial. We could see people of all ages and types dancing wildly in front of the church in a joyous conga line. That's all we figured out.We had no idea what they might be selling or what message they were trying to send. But we could image it would look pretty hilarious once seen on TV. 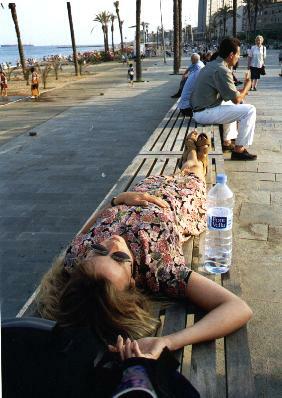 Barcelona is blessed with a magnificent city beach. 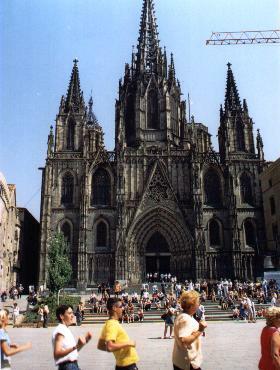 The surrounding area, called Barceloneta, has its own unique character. Our friends in Paris told us we had to see it so we walked for hours all around Barcelona and then made our way to this little area. After 5 hours of walking Tiff collapses on a nearby bench completely exhausted and begging Hans to stop all this walking madness. "Haven't you heard of a cab? ", she says. She couldn't take one more step. Well - one more - to a restaurant to have some of Spain's famous seaside paella here. While we were in Barcelona, Brazil played and won their first elimination game against Chile. 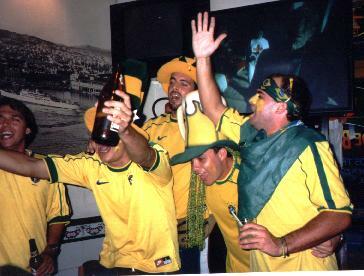 We watched the game in a Brazilian bar with Brazilians who wanted Brazil to destroy everyone in the Cup. These raucous party animals came as a group from Sao Paulo with the sole intent of enjoying the World Cup Partying throughout Europe.